Verifying your existing subscribers for GDPR is easy! First things first: you should make sure that your new subscribers go through a double opt-in subscription process. Once that is done, all that remains is to a create a segment which contains those subscribers who are not verified through a double opt-in process and then take their consent. 2. Click on the name of the mailing list whose settings you want to change. 3. Click on the List Settings option, on the menu that appears. 4. Choose the Activate Double Opt-in for this list but continue sending to all subscribers option, on the Opt-in Settings tab. 5. Choose the Sender from the drop-down menu. 6. Set up the Subject of your email verification. Make sure that your subject line is catchy enough to make your new subscribers give their consent by clicking on the verification link contained inside the email. 7. Check the confirmation message. We wrote the content for you, but you can always change it by typing in the available message box. 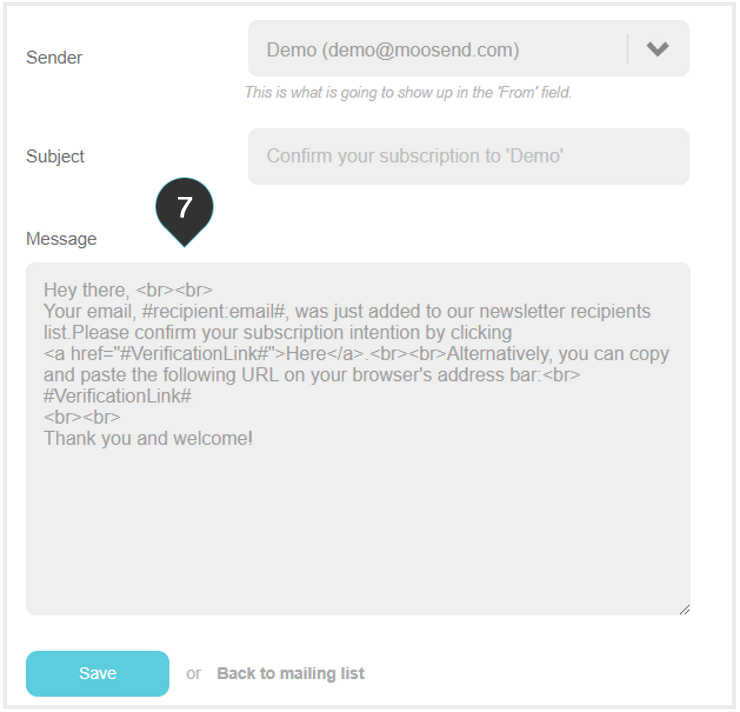 You can also design an HTML message in our editor and then just copy and paste the HTML code in the message box. Just make sure that you include the #VerificationLink# tag, otherwise it will automatically be placed at the bottom of the message. Now that you the double opt-in process is set up for every new subscriber, all that remains to be done is to find all the subscribers who are not yet verified through a double opt-in process, and ask for their consent. To achieve this you will create a segment which will contain those unverified subscribers! 8. Click on the Segments option, located on the menu on the left. 9. Click on the Create New Segment button. 10. Fill-in the name of your segment in the available text area. 11. Click on the Add More Criteria button. 12. Choose the Verified for Double Opt-in option, from the first drop-down menu. 13. Select the option no, on the second drop-down menu. This way all the subscribers who are not verified via the double opt-in mechanism are selected by this segment. Click on the Save segment button when you're done. Now that you have segmented your mailing list, you can contact the non-verified subscribers by sending a cool campaign, asking them to re-subscribe to your mailing list. Every one who does will receive the confirmation e-mail you created, giving you their consent. Don't forget, your segment is dynamic! This means that every subscriber who gets verified will automatically be removed from the segment.